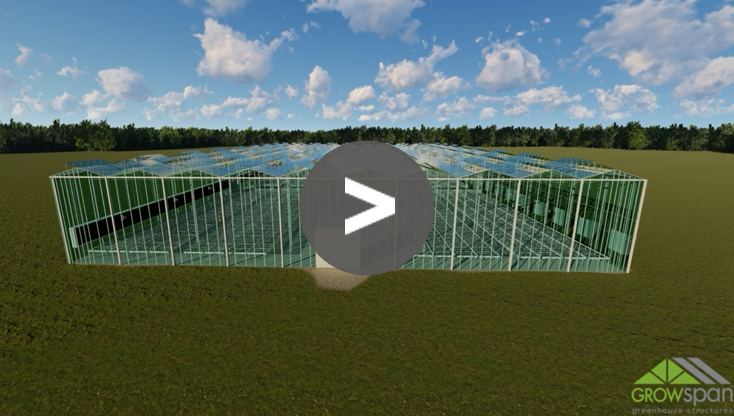 For over 40 years GrowSpan has been providing commercial operations with unique greenhouses tailored to their specific operational needs, and GrowSpan’s Venlo Series Greenhouses allow growers to produce on the largest scale. The Venlo Series provides commercial growers with highly flexible greenhouse solutions, and there are three different styles to choose from. The GrowSpan Traditional Venlo Greenhouse is what everybody thinks of when referencing Venlo structures. This greenhouse features a strengthened aluminum roofing system that promote maximum light transmission, and it’s increased vent to floor ratio ensures superior ventilation. The GrowSpan Cabrio Venlo Greenhouses is for growers looking to completely maximize light transmission and ventilation. The roof fully opens up, so light and fresh air can freely enter the structure. The GrowSpan WideSpan Venlo Greenhouses is designed with a film roof and allows growers in high temperature climates to easily establish an ideal growing environment. These structures are favored by commercial growers due to their size, increased light transmission and the ability to easily integrate all the necessary environmental control equipment. The durable designs ensure that GrowSpan Venlo greenhouses will last decades into the future. To optimize your production and profitability, Request a Quote today.